These delicate arancini are so moreish. Try serving them as canapés at your next party and watch them disappear. Mix the chopped ham and parmesan into the cold risotto, then roll the risotto into small balls, each about the size of a golf ball. Sprinkle 40g/1½oz of the flour onto a plate. Beat the eggs in a bowl. Sprinkle the breadcrumbs onto a separate plate. Dust each risotto ball in the flour, then dip into the beaten egg, then roll in the breadcrumbs until completely coated. Carefully lower the arancini into the hot oil in batches and fry for 2-3 minutes, or until golden-brown and heated through. Remove from the pan using a slotted spoon and set aside to drain on kitchen paper. Keep warm. Meanwhile, in a bowl, whisk together the cornflour, the remaining flour and the sparkling water until smooth and well combined. Dip the courgette flowers into this batter. Fry the courgette flowers in batches for 1-2 minutes, or until the batter is crisp and golden-brown. Remove from the pan using a slotted spoon and set aside to drain on kitchen paper. 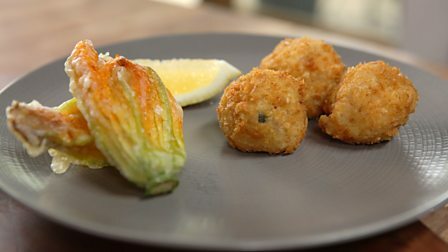 Serve the arancini with the courgette flowers and lemon wedges alongside. If you want to make the arancini from freshly cooked risotto, spread the cooked risotto onto a large, high-sided baking tray lined with greaseproof paper and leave in a cool place. Once cool, chill for as long as possible before rolling the risotto into balls.